Landscaping covers all the infrastructure of your garden, from retaining walls to leisure areas such as patios and decking and at Horsham Decks and Patios we're happy to do it all. Our Horsham landscapers will work with you to turn your outdoor space into a garden you can be proud of. We will build walls and ornamental fencing around your boundaries or to delineate different areas to add structure. 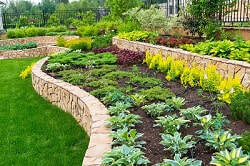 We can build raised beds and vegetable planters and re-lay or re-seed your lawn. And if you have employed a garden designer, we can work with them to create your perfect garden. Why not have a pergola or a rose arbour to give an interesting perspective to your garden, or add bespoke features, such as statues or artwork to create a unique oasis. Sometimes carefully-placed mirrors can bring light to a dark corner (making sure not to blind you or the neighbours of course!) The possibilities are endless and we'd love to help build your dream garden. As well as giving you a wonderful space, landscaping your garden can add value to your property and make it easier to sell if you decide to put it on the market. Imagine a buyer comparing two similar properties when one has a rough patch of lawn and a few shrubs, while the other has a wonderful outdoor space that sells itself. Which would you choose? Many gardens on modern housing estates are simply rectangles - a blank canvas where one's imagination can run riot. Perhaps you'd like to add more interest and shape variations to differentiate your plot from those of the neighbours. We can add curves, meandering paths and judicious planting to transform your garden. If it's on an incline, why not include some steps built from paving slabs or brick, or incorporate a multi-level deck, making a feature that can add character and charm. No garden is complete without an area where you and the family can chill out or play. The choice of decking and patios is huge, whether you build it adjoining the property or a remote area where you can relax in peace. No garden is too small to have a deck or patio and you can choose from economical softwood, hardwood or a composite decking. Our landscape gardeners can incorporate seating or a barbecue area to suit your requirements. Our landscape contractors work all around the Horsham area, including Billingshurst, Pulborough, Southwater, Ashington, Burgess Hill, Crawley and Steyning. Call us now on 01403 540162 to have a chat about the landscaping services you need, whether that's a complete garden landscape or some work to brighten up a corner or to add a special feature.